This section covers the more advanced 2D drawing features. 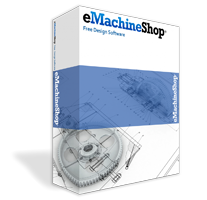 These features will save you time, however most can be accomplished using the commands covered in the basic 2D drawing section so you might want to skip this section if you are new to eMachineShop and return later. Obtain the digital image on your screen – best if it fills a good portion of your screen. Choose Edit | Preferences | General | Tracing Paper. 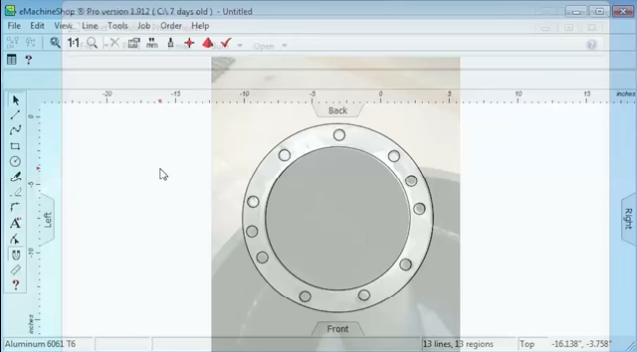 You should now see the eMachineShop CAD interface and the image at the same time. Use the eMachineShop CAD drawing features (straight lines, arcs, circles, spline curves or the freehand tool) to trace the shape. Uncheck Edit | Preferences | General | Tracing Paper. Choose Edit | Select All. Drag the corner handles to resize to the desired physical size per the ruler. Set the Z value to the desired thickness. Select View | 3D to verify the shape of the part(s) (resolving any presented errors). Choose Job | Material and select a material. Alternatively, to convert an image to eMachineShop CAD format you can use a software package such as Corel but we find such software packages often don’t work so well as they create numerous line segments which bog down the CAD software and make editing difficult. They also can create bumpy lines instead of clean smooth lines. Another method of getting graphics into the eMachineShop CAD is to use a drawing tablet. Although the eMachineShop CAD does not directly support tablets, most tablets can export DXF files which you can then import. You can convert an image to a CAD drawing automatically with appropriate software. Traceart seems to do a reasonable job and has a trial version. You can change a shape by moving its points or line segments. For example, you might need to move one end of a straight line or arc or one side of a rectangle. In the left toolbar click Line Edit. Drag points or lines to the desired locations. Hold down the CTRL key as you drag to restrain movement to a horizontal or vertical motion. Select the line or group of lines. If you want to end up with the original AND mirrored line choose Edit | Copy, Edit | Paste. Drag the appropriate selection handle (small black square) to the opposite side of the shape. Tangent lines are lines that smoothly meet an arc or circle. You can draw a line tangent to one or two circles or arcs. For example you might need a tangent line in designing a mechanical cam. From the left toolbar enable Snap to Lines. Draw a straight line starting away from the curve. When you approach the tangent point, the line will snap to the tangent position. Choose Line | Tangents. All possible tangent lines will be created. Dividing a line breaks the line into a specified number of equal pieces. You can divide straight lines, arcs and circles. For example, if you are designing a flywheel you might want to divide the circle line representing the inner ring into 6 parts to prepare to draw 6 spokes. Enter the desired number of pieces. Contouring creates a new closed shape at a fixed distance (inside or outside) from an existing closed shape. For example, you might use contouring to create a pyramid shape using progressively larger squares in a stepped arrangement. Select a distance and placement for the new line. You can have a line or group of lines repeated vertically, horizontally or in a circular pattern. Set the numeric bar nudge value to the desired distance between copies. Push in the Repeat button. Click a Nudge arrow button once per copy. Set the numeric bar rotation nudge value to the desired angle between copies. Click the line again to activate rotation mode. Drag the rotation center icon to the desired center of rotation. Click a Nudge rotation button once per copy. Make the first row using the method described above repeating to the right. Select all the items in the first row. Follow the same method but repeat downwards. You can change position, size, shape of the line by entering numerical values. Rotating- You can rotate any line or group of lines by a numerical values. For example, you might want to rotate a rectangle 30 degrees. Scaling- You can change the size of any line or group of lines in your drawing. You can resize lines horizontally, vertically or both. For example, you might need to enlarge your entire drawing. Converting Splines to Arcs- You can convert splines into multiple arcs. For example you might need to convert to arcs for a machine that does not support splines. Select the line or group. If you want to specify the center of rotation, single click a second time and move the center-of-rotation icon to the desired location (using the snap feature if needed). Choose Line | Transform | Rotate. Enter the desired angle (e.g. 30). You can also enter expressions. 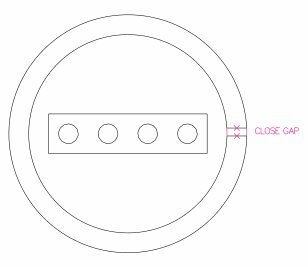 For example if you want a bolt circle of 5 holes you could enter “360/5”. Choose Line | Transform | Scale. Check the desired vertical and horizontal scale. Check Proportional scaling to scale equally along both axis. Comments To Myself are special text and lines for your own reference. For example you might use Comments To Myself to note a part number of a machine screw or the location of a mating part. You can use Comments To Myself to show how other parts will fit onto the the part you are designing or to sketch out a mechanism. Below is an example of a base for a mechanism along with various gray lines set as Comments To Myself. The drawing illustrates an invaluable method of checking how parts fit and work together. Draw the lines or draw text with the text tool. Choose Line | Machine | Comments to Myself. Select a Line Type (Solid, Dashed, Font, Arrow or Dimension). If you look at professionally designed components you will often see smooth curves. Parts with smooth curves are good for DFM (design for manufacturing) and look good. Delete the outer shape (e.g. the large rectangle above). For each hole or cutout do Line | Contour | Outside. Where needed: select two arcs from the contours and choose Line | Tangents. By adding the gap in the ring, the outer part no longer fully encloses the inner part. As a result the CAD software allows the design. The Comments To Machinist (red lines and text) clarifies that you really want the ring closed. a bolt hole tangent to some edge and also, when the part is rotated 45 degrees, tangent to another edge. the center of a hole on the circumference of a circular part and, when the part is moved by 1 inch, on some edge . You can accomplish these types of design challenges by repeatedly experimenting with different positions until the result is close to what is desired. But that method is time consuming and inaccurate. Instead, create temporary guidelines and use the intersection feature. In the video below, we’ve designed a jig with a flat plate. Watch how perpendicular lines are used to define the constraint. Draw a straight line representing the horizontal center. Draw a straight line representing the vertical center. Snap the hole to the intersection of the two straight lines. Lines made up of many small segments can result in large files and slow operation. Such lines can be simplified to fewer segments. This is often useful after importing shapes from other sources. On the status bar view the number of segments. Choose Line | Transform | Simplify and enter the desired tolerance which indicates how far you will permit the converted line to deviate from the original line (large values will simplify the line the most). To see the simplification choose Line | Ungroup and click on segments.